This is not my kitchen. It is the beautiful, covetable kitchen of Katiedid. I love the materials, the colours, the style, the lighting, the open and closed shelving. But most of all I love the handles. Look at them... simple, classic, clean. A perfect fit with the shaker cabinets. It is amazing what a difference something as simple as a handle makes. 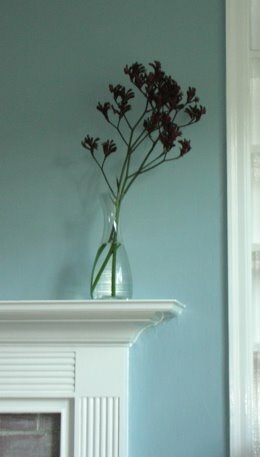 But it's the details that make a room work. Katiedid's kitchen is splendid because of the restrained colour palette, the well-thought out lighting, the drama of the carrera marble backsplash, and the clean lines of the layout. Take any one of these things in isolation and you have something nice... put them all together and get something memorable. I'll be mixing it up a little, using the pulls for the uppers and doors, and these rectangular pulls (a different take on cup pulls) for the pot drawers and utensil drawers. The whole look of the room will be clean-lined and angular. To avoid chipping the finish, put a piece of masking tape over the spot you will be drilling. Also, start with a small pilot hole made with a nail so your drill bit can start spinning under the finish. Oh, and use a sharp bit! Thanks for dropping by katiedid! Hope you don't mind my posting - I LOVE what you have done with your home...the kitchen, the deck. You have wonderful taste and are a wealth of inspiration! Thanks for the tips raven! We'll definitely keep those in mind. 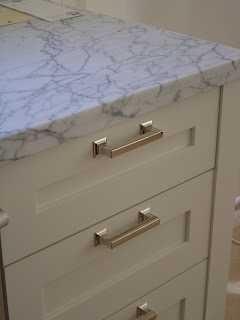 We used that hardware on our "bar" cabinetry, and I absolutely love them. Hefty and very pull-able. Good luck with them! Oh, and I told my cabinet people not to drill for hardware either. There's no WAY I'll be able to select that until I see everything in place. Smart thinking smilingjudy. HandyMan has a hard time visualizing the handles too but he’ll have to trust me on this one, lol. Gorgeous kitchen. I love the hardware you're going with, esp. the modern twist on the traditional cup pulls. Big fan of cup pulls on drawers! We installed our hardware ourselves too (I found them for 1/4 of the price on ebay) and it couldn't have been easier. We drilled a template first and used that to drill the holes. Took about an hour. Smilingjudy, I went with white on black (honed granite) for my kitchen and I love it. 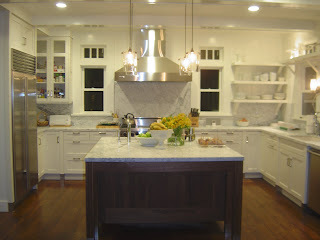 Fantastic kitchen reno-great choices on the finishings! Where did you find the rectangular pulls? Thanks gottago. I bought them on ebay from seller bluebirdbooks. I know Home Depot & Lowes carry the brand (Hickory Hardware, Studio line) so you may be able to get them there via special order too.